The year began with a flourish of weddings (have we just invented a new collective noun?) at various venues including Queenscliff, St Mary's Cathedral and The Gunner's Barracks, Georges Heights. In April we were delighted to sing at choir member 'Captain Tenor' Richard's marriage to Tamika at St John's Anglican Church in Glebe. Early May saw The Bees perform two sets at The Kings Cross Food & Wine Festival. On a perfect autumnal Sydney afternoon we were very well received by the large and enthusiastic crowd and this was possibly the first time we were introduced on to stage by a six foot tall drag queen! 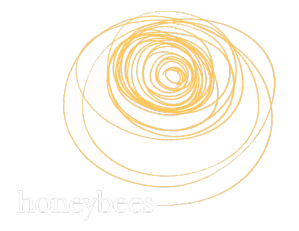 The following Saturday we held our own Honeybees Gig at the Glebe Town Hall. This was a sell out event with nearly 200 guests. We performed many of our old favourites with the addition of some new numbers including Run Mourner Run, Didn't it Rain & the community 'sing-a-long' We Shall Not be Moved. It was a great evening and modesty prevents us mentioning the two standing ovations! 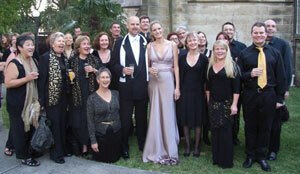 Also in May, The Bees performed a short set of five songs at the Eastside Arts' "Club A Cappella" Concert in Paddington. Other groups included The Amazing Grace Singers, Eastside Voices, Stampadowns and a passionate set by The Sydney Street Choir. In mid-June we braved the atrocious Sydney weather conditions to perform a benefit concert for the Allowah Children's Hospital at Epping Presbyterian Church. In front of a 250 strong audience,The Bees performed two sets with some of the newest choir members joining us for the first time. Didn't It Rain proved to be a particularly apt song as Sydney experienced heavy rainfall for virtually 48 hours solid. A total of $15,000 was raised on the evening. In September, a number of members of the choir sang at four concerts in The Concert Hall of the Sydney Opera House as back up to Josh Groban on his song ‘You Raise Me Up’. The following week a few of the choir sang as back up to Delta Goodrem on her song ‘I Believe’ for the industry launch of her new CD. Once again this was at The Opera House – though this time in The Studio.